Geologists are uncovering mounting evidence of asteroids and meteorites that struck the earth during the past. Are these extraterrestrial missiles somehow related to the initiation of the Flood? 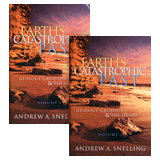 But what catastrophe might God have used to cause the earth’s crust—many miles thick—to crack? Most creation geologists believe that the opening of “the fountains of the great deep” refers to the breakup of the earth’s crust into plates.1 The subsequent rapid, catastrophic movement of these plates would have released huge quantities of hot subterranean waters and molten rock into the ocean. As the hot water gushed through the fractured seafloor, the water flashed into superheated steam and shot high into the atmosphere as supersonic steam jets, carrying sea water that eventually fell as rain. But what catastrophe might God have used to cause the earth’s crust—many miles thick—to crack? Some have suggested a meteorite or asteroid impact of unprecedented size and scope.2 Do we find any evidence? Geologists have discovered some gargantuous remnant craters and piles of debris leftover from massive impacts that easily fit the bill. A Smoking Gun in Australia? 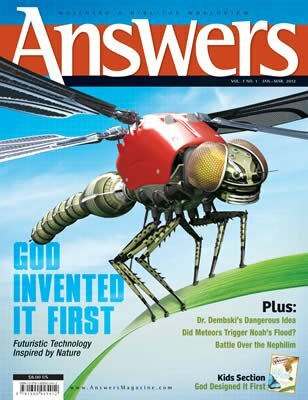 An asteroid impact—or several simultaneous impacts—that triggered the Flood may also have been part of an ongoing, solar-system-wide catastrophe that lasted for months or years.5 If so, we would expect to find evidence of many other meteorites that subsequently hit the earth during God’s judgment on the planet. Two lines of evidence can be used to support this inference: (1) the rapid rate of past cratering during the Flood, and (2) the fields of meteorites left by this bombardment. A massive asteroid, perhaps 2.5 miles (4 km) wide, slammed into the earth at the start of the Flood, leaving a 56-mile-wide (90 km) impact crater in South Australia. Did this explosion, which equaled 50,000–100,000 hydrogen bombs, help trigger the Flood? Many meteorite impact craters have now been identified across the earth’s surface. These have been imprinted and preserved in layers deposited by the Flood6 and are also visible on today’s post-Flood land surface, such as the famous Meteor Crater just east of Flagstaff in northern Arizona. Geologists have found over a hundred impact craters on earth. On this table 39 of the 110 impacts were deposited in the uppermost rock layers, and the rest were spread over the many lower layers. If all these layers were deposited slowly over millions of years, then impacts have been more common in recent times. But if most layers were deposited during the year-long Flood, 71 impacts occurred during only one year. The other 39 were spread over the next 4,500 years. The impact “ages” of 110 craters (as estimated using the secular dating methods) are tabulated in Figure 2.7 Secular geologists thus believe that large meteorites crashed into the earth at a rate of 1–8 every 30 million years, but that the rate was much higher in recent times. However, those scientists who believe that the bulk of the fossil record was deposited during the Flood reach a very different conclusion. According to the Flood model, the first 71 of these 110 impacts would have occurred during the year of the Flood, and the other 39 were spread out over the 4,500 years since the Flood. The rate during the Flood was catastrophic—71 in one year versus an average of only one impact every 115 years. Even most of those 39 post-Flood impacts likely occurred in the first few decades after the Flood, as the catastrophic processes that triggered the Flood slowed to today’s snail’s pace. Not surprisingly, fossil meteorites have been discovered in various layers of the Flood’s geologic record. One of the most meteorite-dense areas in the world known to date is found in Ordovician limestone beds in central and southern Sweden.8 These deposits are among the earliest laid down by the Flood. Forty fossil meteorites have been identified over the area within the Thorsberg quarry at Kinnekulle, southern Sweden.9 They vary in size from 0.28 x 0.40 inches (7 mm x 10 mm) to almost 6 x 8 inches (15 cm x 20 cm), and were recovered from a quarry area of almost 65,000 square feet (6000 m2). So far, no impact crater has been found associated with these fossil meteorites. Numerous chemical analyses have determined that these are all ordinary chondrite meteorites.10 Roughly 80% of meteorites that have fallen to the earth since the Flood are also chondrite meteorites. These forty fossil meteorites were recovered from Ordovician marine limestone beds, which are part of the Orthoceratite Limestone that was deposited across at least 100,000 square miles (250,000 km2) of the Baltic-Scandinavian region. The quarried section holding the meteorites is 10.5 feet (3.2 m) thick and has been divided into twelve named beds (Figure 3). At a quarry in Sweden, over forty meteorites have been found in a 10-foot (3 m) section of limestone. The fragments are scattered in twelve thin beds deposited early in the Flood. They share the same metallic qualities, as though they came from one meteor, which exploded when it entered the earth’s atmosphere. According to secular dating methods, these beds are estimated to have accumulated over 1.75 million years at an average rate of only 0.08 inches (2 mm) per 1,000 years. Interestingly, many of these forty fossil meteorites were discovered embedded at the contact surfaces between layers where secular geologists claim that nothing was being deposited for periods ranging from 100 to 1,000 years. Thus, secular geologists suggest that these meteorites fell on at least twelve different occasions. However, entombed with these fossil meteorites are abundant fossilized straight-shelled nautiloids, many up to about 16 inches (40 cm) long and about 2.5 inches (6 cm) thick. This begs the question—how could these fragile nautiloid shells be buried and preserved with their internal anatomy intact, and exhibit no signs of decay or erosion during such long periods when no sediments were being deposited? And how could water deposit these limestone beds and their fossil contents so evenly over such a vast area of at least 100,000 square miles (250,000 km2)? Even though the fossilized nautiloid shells show no particular orientation, they had to be buried rapidly to be so well preserved. Such rapid sedimentation over such a wide area requires a catastrophic flooding event. Furthermore, since all these fossil meteorites are essentially the same, and all likely accumulated during rapid sedimentation and catastrophic flooding, they could easily represent the remains of one meteorite fall. Such a catastrophic meteorite bombardment is consistent with the global judgment during the biblical Flood. 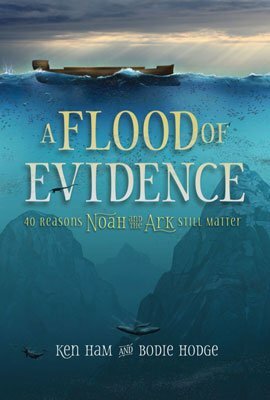 We cannot be certain whether God used an asteroid or swarms of asteroids to begin the Flood event and the resulting breakup of the earth’s crust into plates. However, we do find evidence that asteroids were striking the earth at catastrophic rates during the Flood and that these asteroids were spread over the earth’s surface. Asteroids surely contributed greatly to the horrific and violent geologic events that took place during God’s year of judgment of the earth. In Genesis 6:7 and 6:13 God declared that He would destroy man, beasts, creeping things, and fowl “with the earth.” This global Flood cataclysm would destroy the landscape of the original earth (2 Peter 3:6). The original landmass was broken, flooded, and pulverized. The many impact craters and fossil meteorites are stark, sober reminders that God keeps His Word. These signs of judgment also remind us that all who trust God for salvation, like Noah, are recipients of His grace and mercy through the Lord Jesus Christ. Jesus is our Ark of salvation, delivering us from the judgment by fire yet to come (2 Peter 3:7). 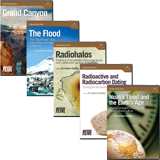 S. A. Austin et al., “Catastrophic Plate Tectonics: A Global Flood Model of Earth History,” Proceedings of the Third International Conference on Creationism, ed. R. E. Walsh (Pittsburgh, Pennsylvania: Creation Science Fellowship, 1994), pp. 609–621. W. S. Parks, “The Role of Meteorites in a Creationism Cosmology,” Creation Research Society Quarterly 26 (1989): 114–146; W. R. Spencer, “Geophysical Effects of Impacts during the Genesis Flood,” Proceedings of the Fourth International Conference on Creationism, ed. R. E. Walsh (Pittsburgh, Pennsylvania: Creation Science Fellowship, 1998), pp. 567–579. 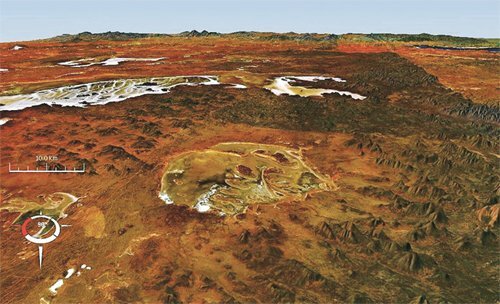 G. E. Williams, “The Acraman Structure—Australia’s Largest Impact Scar,” Search 18 (1987): 143–145; G. E. Williams, “Acraman: A Major Impact Structure from the Neoproterozoic of Australia,” Geological Society of America Special Paper 193 (1994):209–224. G. E. Williams, “The Acraman Impact Structure: Source of Ejecta in Late Precambrian Shales, South Australia,” Science 233 (1986): 200–203; V. A. Gostin et al., “Impact Ejecta Horizon within Late Precambrian Shales, Adelaide Geosyncline, South Australia,” Science 233 (1986):198–200; M. W. Wallace et al., “Discovery of the Acraman Impact Ejecta Blanket in the Officer Basin and its Stratigraphic Significance” Australian Journal of Earth Sciences 36 (1989): 585–587. W. R. Spencer, “Catastrophic Bombardment Surrounding the Genesis Flood,” Proceedings of the Fourth International Conference on Creationism, ed. R. E. Walsh (Pittsburgh, Pennsylvania: Creation Science Fellowship, 1998), pp. 553–566. D. D. Bogard, “Impact Ages of Meteorites: A Synthesis,” Meteoritics 30 (1995): 244–268. R. A. F. Grieve, “The Terrestrial Cratering Record,” Accretion of Extraterrestrial Matter Throughout Earth’s History, eds. B. Peucker-Ehrenbrink and B. Schmitz (New York: Kluwer Academics, 2001), pp. 379–402. P. Thorslund and F. E. Wickman, “Middle Ordovician Chondrite in Fossiliferous Limestone from Brunflo, Central Sweden,” Nature 289 (1981): 285–286. J. O. Nyström et al., “Discovery of a Second Ordovician Meteorite using Chromite as a Tracer,” Nature 336 (1988): 572–574. B. Schmitz et al., “A Rain of Ordinary Chondritic Meteorites in the Early Ordovician,” Earth and Planetary Science Letters 194 (2001): 1–15; B. Schmitz et al., “Accretion Rates of Meteorites and Cosmic Dust in the Early Ordovician,” Science 278 (1997): 88–90; B. Schmitz et al., “Geochemistry of Meteorite-Rich Marine Limestone Strata and Fossil Meteorites from the Lower Ordovician at Kinnekulle, Sweden,” Earth and Planetary Science Letters 145 (1996): 31–48; B. Schmitz et al., “Sediment-dispersed Extraterrestrial Chromite Traces a Major Asteroid Disruption Event,” Science 300 (2003): 961–964. There are three major types of meteorites—iron, stony-iron, and stony. Chondrite meteorites are a kind of stony meteorite. They derive their name from their texture. Dispersed more or less uniformly throughout the rock are spherical, sub-spherical, and sometimes ellipsoidal structures called chondrules, ranging in size from a fraction of an inch in diameter to about half an inch. Chondrites are primarily made of silicate minerals such as olivine and pyroxene, similar to what is found in earth’s volcanic rocks, along with sulfide and metallic minerals. O. R. Norton, The Cambridge Encyclopedia of Meteorites (Cambridge, UK: Cambridge University Press, 2002).